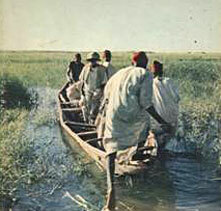 In 1946, three friends from Ponts et Chaussées, the engineering school in Paris, descended the Niger River in a dugout canoe. Under the name Jean Pierjean, a combination of each of their names, they sent photos and articles back to Paris to pay their way, and made 16mm films of a hippopotamus hunt that some of their African friends were engaged in. When one of the three — Jean Rouch — lost his tripod in some rapids, they were forced to continue filming with a handheld camera. And thus the early history of cinéma-vérité, a term Rouch would later coin, began to unfold. Over the next half-century, Jean Rouch would go on to chronicle a period of extraordinary change in Africa, from colonialism through independence and up to the present. His films give us insights into such aspects as possession rituals, social life, and migration, as well as the life of the imagination in this time period. Among his most influential films are the landmark cinéma-vérité film Chronique d'un été, which was shot in Paris, and the 'ethnofiction' films Jaguar and Moi, un noir, in which the lines between truth and fiction, and dream and reality, are often blurred. Rouch was clearly present in his films, bringing in elements of improvisation and provocation. "It means entering into it," he wrote. "Because making a film, for me, means making it with your eyes, with your ears, and with your body." Sadly, Jean Rouch died in a car accident in Niger, on February 18th, 2004, at the age of 86. We at DER are among the many who remember him with great affection. As the primary North American distributors for Jean's films, we were privileged to work with him over many years. Jean's exceptional and long-term engagement with his subjects, and the intimacy and authenticity of his filmmaking, exemplify the qualities we look for in all of the work we represent. Above all, in Jean's films there is a sense of adventure and humor, and a respect for people. As John Marshall, DER's founder, said of Jean, "Underneath it all, he was always about persons." Craig Johnson, who donated the development of this site, is also one of the many lives that Jean Rouch deeply touched. We feel compelled to celebrate his life and his work, to share memories with others who knew him and to enlighten those who are just now becoming acquainted with his legacy. And this is why we have created this tribute.